Do Be Do Bead Do: Welcome to the Bead Soup Blog Party!!! very nice! love the earthy muted colors! It is great when you are so happy with a piece you have made. What a great feeling! And you are right to be proud of this one. I really like it. Nice work, Sandi! You always pull together such beautiful colors. Great job. Very nice use of your soup! very pretty. you made a lovely piece. oh my gosh that's gorgeous!!! I LOVE all the colors, textures and it's asymetrical!!!! my favorite! I'm so glad we got partnered up, I love chatting with you and feel so blessed to have you has my partner and now friend :) HUGS!!!! Great job, Sandi! Yummy soup! Sandi, that turned out so great. I love all the color and the "texture" you put into it. It's lovely. Oh I love it! Those colors and shapes make for one striking necklace. Thank you all so much for your wonderful comments... I'll be visiting all of your blogs soon!!! You did a bang-up job! I love your work! 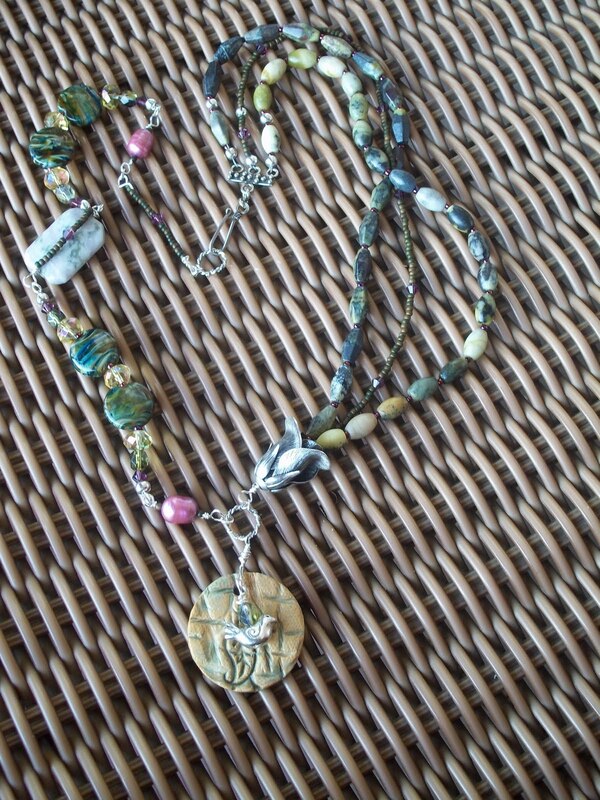 I love the colors of the necklace you designed, Sandi! It's just lovely! Very nice design, love how you have brought it all together. Very pretty! That is truly a beautiful necklace. I'm sure you'll get lots of enjoyment wearing it. Love the silver rose, and all the wonderful colors you mixed in. Great job! Lovely necklace! We’re all being pushed outside our comfort zones — with amazing results! All of your hard work definitely paid off. It's a lovely necklace, and the pops of magenta really pull the whole thing together so nicely! Wonderful necklace! I love your style! Your necklace is super cute! Is lampwork beads the glass beads? It's really outstanding. 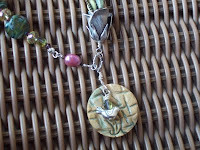 Everything os working...color scheme, balance, the silver rose bead! You rocked it! omg that is just so pretty! Wonderful work! Beautiful use of all of those beads!! i love the soup that You sent to Marianna as well!!! great job!! Love your necklace - very pretty!! It is a great feeling when beads speak to you and you know exactly what to do on the moment you see them. I see all the work you put in your necklace and I think you did a great job mixing your stash with the beads received. The pendant is so pretty and your necklace turned out great. Love the green tones. Oh so pretty! 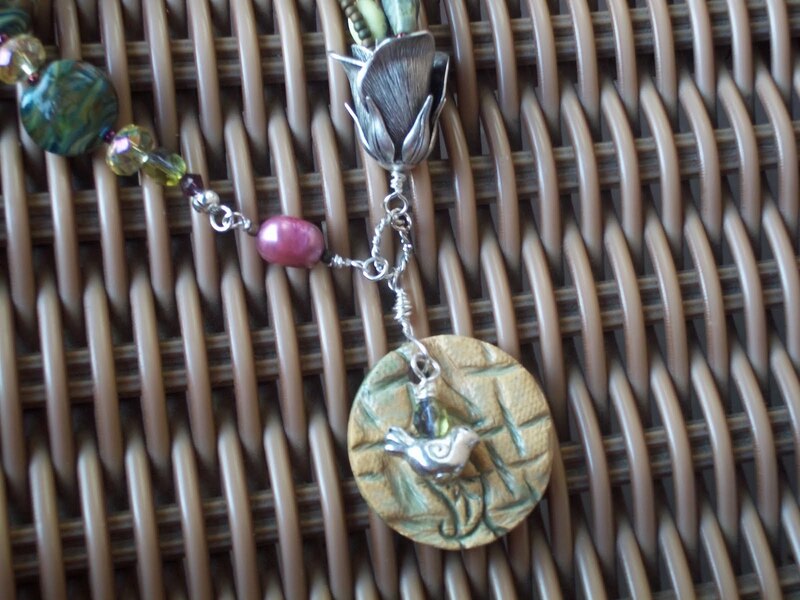 I love the little details of the little bird stacked on top of the pendant, the pretty silver flower and the accent of seed beads that sits across the top of one of the strung beads! Very creative! 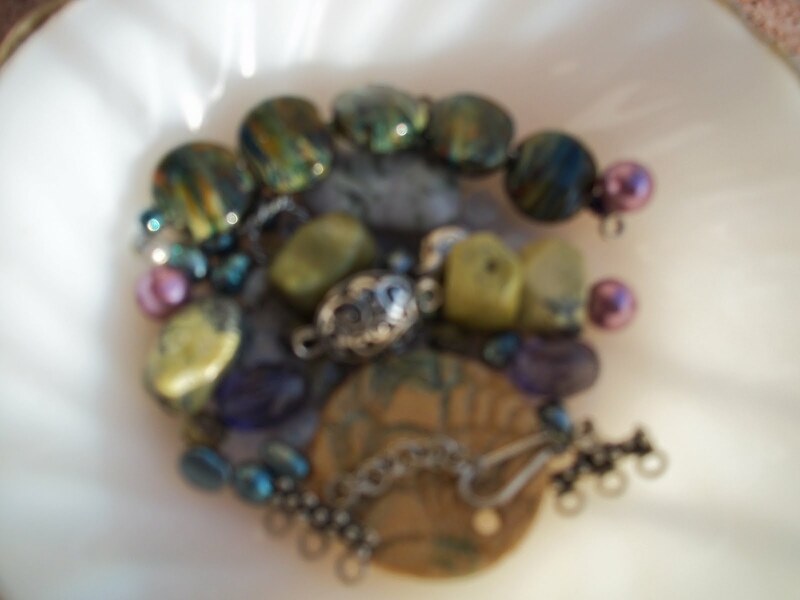 Isn't it great that an idea pops into your head the moment you see a bead? It's magic! Oh wow, your necklace is absolutely beautiful! Your heart and soul definitely show through in this necklace. It's a wonderfully beautiful piece that brought a smile to my face just as soon as I saw it. You really rocked this! Happy color plus happy designer equals a happy jewelry piece. Beautiful and wearable for sure! You did a Fantastic job with your soup mix. Soup-er Cool! Lovely! I feel like the necklace is dancing - full of joy! Like the asymmetrical look! Nice job! 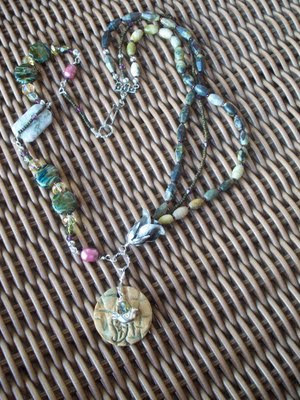 I love all the colors in the necklace - fun! The pendant is so sweet! I love how you pulled everything together. Beautiful! Love your necklace design, it's so pretty. Truly stunning necklace! Pretty muted earthy colors that would grace many outfits! You should be proud! Beautiful necklace :) Love how you put all the soup together. Beautiful necklace! I love the colors and design details! Beautiful - I love the combination of stones!!! Good for you for taking the chance to really stretch yourself with this challenge - nice job! Lovely necklace, I really like how you put all your ingredients together; the three strands on one side still a very balanced effect. Great Job! Lots going on here, and I love it! The colors, shapes,and textures all come together so nicely. Gorgeous focal! Lovely necklace! I like the asymmetry and how well the different beads and colour go together. A really great job! I love all those colors! A very pretty necklace! Love your piece... lots of love there! Have a super day! Very interesting and pretty piece. Love what you did with your ingredients.